Prerequisite(s): Current River Rescue Certification, or approved equivalent, and excellent basic rescue skills including the use of throw bags, basic knots, anchors, and an understanding of basic access options is essential. This course is the second level of River Rescue Certification, and you must have the skills learned in the basic RRC course to progress to the RRC PRO. Prior river rescue training is essential! This training can come from another dynamic rescue course, the RRC, or a very specific in house rescue training program. Please look at the prerequisites carefully. This certification is equivalent to the ACA Level 5 program, and is recognized world wide. It is an approved rescue course for the New Zealand Maritime, which has some of the highest standards in the Industry. Upon completion, a commitment to maintaining the skill set is essential. Who Course is For: Professional River Guides, Class 4-5 Kayakers, Kayak Instructors, and any other river runners with a commitment to maintain a high level of skill in rescue. An Internationally recognized water rescue certification that is written for Professional BOATERS, by Professional BOATERS. It is a fast paced, scenario based course designed to develop the ability to choose good actions when a river rescue is necessary. This curriculum is generally preferred by river guides and kayakers that spend a good portion of their lives on the river in a professional capacity, and therefore have a solid base of boating and basic rescue skills already. This energetic, and physical curriculum will be challenging and focused on quick reaction time with a thorough understanding of options and resources. The skills testing component will emphasize knowing your own limits, skill level, knowledge of basic rope skills and the ability to execute a rescue as part of a team. The challenges of responding at night are highlighted in the night op. The task book at the end lays out easy ways to keep your certification current with continuing education and testing day options. This two or three day, intensive and comprehensive course takes professional certification for the professional boater to a whole new level. 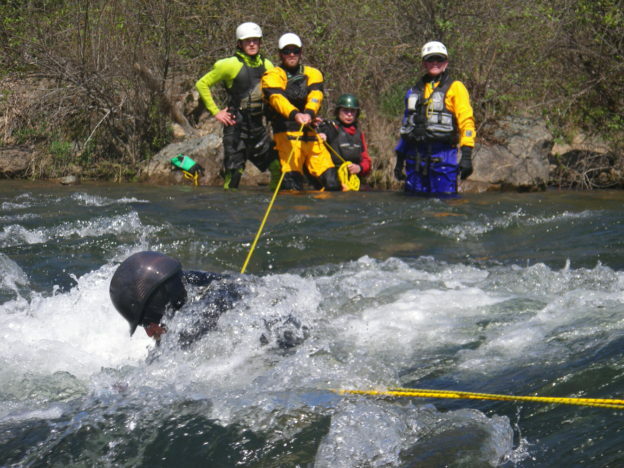 This class meets all requirements for the ACA Level 5 Swiftwater Rescue Certification. Please note: If you need a review of the above, because you are rusty, the RRC PRO can be taught in a 3 day format by special arrangements. Most of our custom booked RRC PRO courses are 24 hours, instead of 16 hours. We have the 16 hour option for folks that are willing to review on their own, and come prepared.